Wow, we slept in this morning--6:30! That is late for us……..
After our usual several cups of coffee, surfing the net and breakfast, we set off to find another "junque" store near our apartment. I was looking for some old French books for a reasonable price. I'd found some wonderful old books on Saturday at the Vanves Flea Market, but they were too many Euros, and too lovely to cut up! Today I found just what I was looking for, paid just a few Euros for a big book of sheet music, and three other old books--perfect for the project I have in mind. 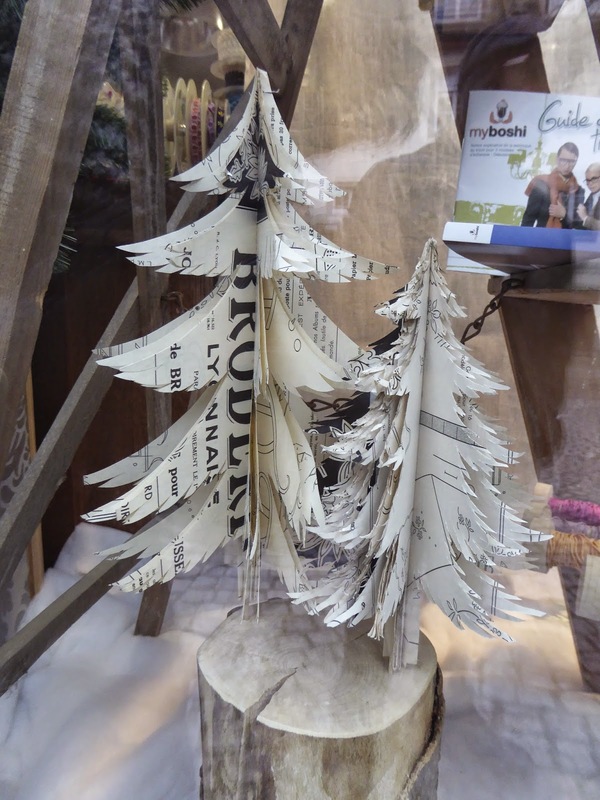 Lovely Christmas trees, as seen in a shop window in Strasbourg. Of course, I would have to use French books for these! We made a quick trip back to our apartment--those books were heavy, and I certainly didn't want to carry them around all day. Our plan for the afternoon was to visit the Canal St. Martin area, which seems to be an "up & coming" neighborhood, from what I've read. It's not an area we've been to and I was intrigued, so off we went. After a couple of line changes we got out at the Republique Metro stop, and easily found our way to the canal. 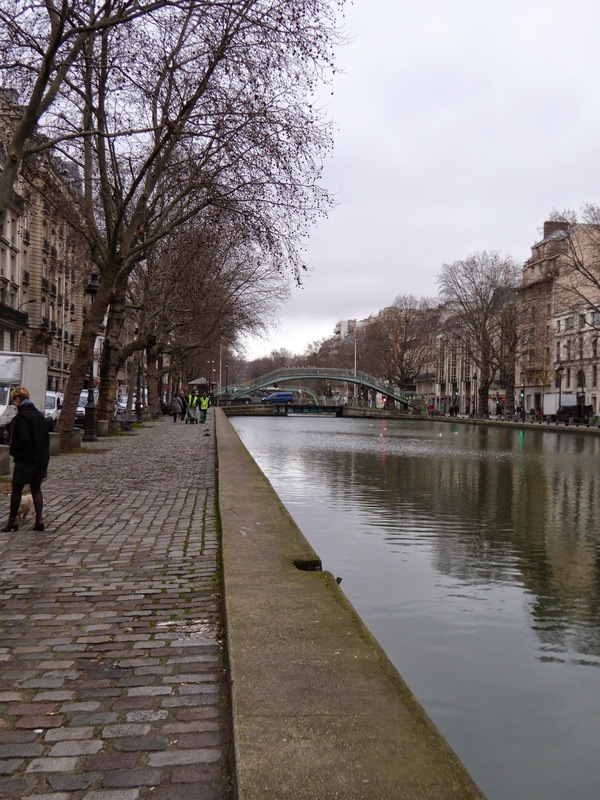 It's a nice, wide canal winding through a small section of Paris, and there are several foot bridges crossing the canal. We planned to walk up one side, and back down the other, which would be quite a long walk. 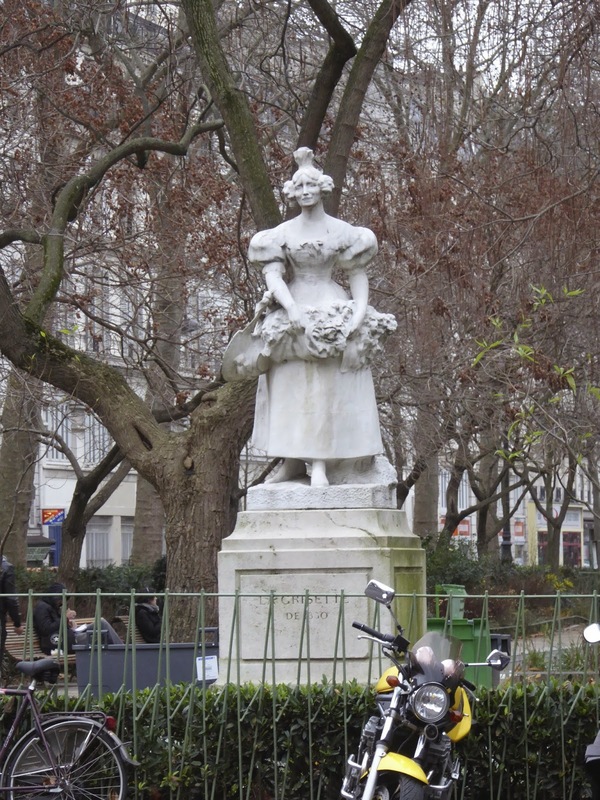 At the beginning of the canal, in the Square Jules Ferry, we found this interesting statue. The inscription reads: La Grisette de 1830. I was intrigued, so I "googled" it and found that a grisette was a term used to describe a young woman of easy virtue, and later came to mean a young woman who was somewhat "bohemian" in their lifestyle. Interesting! This statue was sculpted in 1911 by Jean Descomps. We walked along for a few blocks, then decided to turn up a side street to look for a spot for lunch. We didn't find too much of interest, and soon we came to a wide street--Blvd. Magenta. We thought surely we'd find a nice place for lunch, but we weren't too excited about the menu offerings. I'm not sure why we continued on this street--it certainly wasn't interesting, pretty or even nice. Eventually we found ourselves at Gare d 'Est, we were hungry, tired of walking, and definitely not impressed with the area! We hopped on the Metro, finding our way to one of our old standbys--Leon de Bruxelles. We settled in for a nice lunch of mussels and fries and a couple of Christmas beers. Just what the doctor ordered, and we enjoyed every bite. Well, maybe not what the doctor ordered, because the longer we sat the worse I felt. By now I'm pretty sure I'm coming down with something, and I feel like I've been hit by a Mack truck--frontwards and backwards. I had a brief but lovely illusion of hailing a taxi, settling in for a nice comfortable ride right to the front door of our apartment. Ahhhh, the luxury! Nah--I sucked it up, we trudged back down into the Metro, up & down many sets of stairs, through the long passageways, and finally made it home. Home--where I'm now all snuggled in, resting comfortably with a glass of red wine. I'm pretty sure the doctor would order that, right? Keeping my fingers crossed that I'll feel MUCH better tomorrow---Good night from Paris. Oh Di, I hope you aren't coming down with a nasty cold. Stay warm and drink lots and lots of water. I had a wonderful Christmas dinner at Dianna and Larry's house and then we played with her new camera (a present from Larry). We are already making plans to go birding. Hope you are feeling better tomorrow, and for the last time on the 25th....... Merry Christmas. SATURDAY AND SUNDAY IN PARIS----BRRRRR! ALL IS WELL IN OUR LITTLE CORNER OF PARIS…. A THOROUGHLY MODERN SUNDAY IN PARIS……..
WEDNESDAY IN PARIS--IT'S A PICASSO KIND OF DAY……. WHAT A DAY WE'VE HAD! !